Major Sid Brookshire was born on September 11, 1970. He spent his early years in Springfield, Missouri and graduated from Southwest Missouri State University. He received a commission through the SMSU ROTC program. He was an Army Ranger. His assignments with the United States Army included; 1-506th Infantry at Camp Greaves, Korea; 2-11 ACR at Ft Irwin, California; IOAC at Ft Benning, Ga; 5th Ranger Training Battalion in Dahlonega, Ga; 3-327 Infantry Regiment in Ft Campbell, Ky. In the spring of 2006 he earned a Masters Degree from the War College in Newport RI. Sid was reassigned to FT Stewart, Ga in July 2006 where he was assigned as the S-3 officer for the Desert Rogues of 1-64 Armor Battalion. 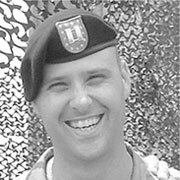 In May 2007 he deployed with 1-64 Armor in support of Operation Iraqi Freedom V. He made the ultimate sacrifice for the United States of America on June 20, 2007 while on patrol in Baghdad, Iraq.